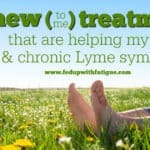 Using antibiotics to treat Lyme never really made sense to me because they actually suppress the immune system. I feel like Dr. Sivieri’s protocol balances supporting and cleansing the body while also keeping the pressure on the pathogens. So far it seems to be helping. Obviously I wish it was working more quickly. 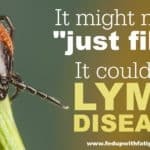 I had hoped to be in remission from Lyme by the end of 2017, but I won’t meet that goal. Still, forward progress is forward progress. Yes, I’m still working w/ Dr. Sivieri. I don’t know if he works w/ people financially or not. I would call his office in Columbia and ask. I wish you well. This is a good free app. for mindfulness breathing. I love it ! It only takes about 3 minutes to do and it is cool that you can calibrate your breath each time. It can be a real helpful relaxation technique. I also do some audio guided relaxation. but I use the Calm app most every day. I hope this helps. using 2 mg. morning dosing. The vivid dreams were annoying (especially with a sleep problem!) but morning dosing helps. No real pain relief from the LDN yet, but from what I read that could take several more months. I also have a significant immune system issue probably related to CFS, and the LDN may help with that as well. We have to advocate for ourselves! The pain doc was willing to let me try LDN when the rheumatologist was not. I am planning to try Quell after reading your articles about it. Thanks for your blog and information. Thanks Donna and other fellow fibro/Lymes/spinal issues etc etc etc sufferers. Sheesh.. The list keeps growing doesn’t it!? Anyway, not much has helped for pain which is usually at between a 6 & 8 because of several spinal issues, arthritis in most of my body and all the rest, so unfortunately I’m forced to still use opiates. It’s very difficult to admit and talk openly about, but because I’ve taken them for so long, when I dont for any length of time I not only can’t handle the pain, I become extremely depressed and I have no functioning ability at all. Apparently my brain is no longer able to produce its own dopamine and other things that are too hard to explain, so I’m kinda stuck. After fighting this battle for over 20 years I’m pretty weary with it all and often feel very hopeless and alone. I don’t feel like I’ll ever totally give up, and I keep on keeping on but at times it gets to be too much,as you all know. That was a bit off topic but I guess I needed to say it. I’ve isolated over the years (Not good,, Don’t do it!!) so I rarely have peeps to talk to that get it. Anyway, what “Has” helped for muscle and nerve pain is Magnesium Malate, which I now know I have to go off of for a little while every few months as it seems to stop working, but when it is working it’s a definite improvement. For sleep I’ve found that alternating between Calms Forte Sleep formula and an herbal remedy of Gaba, passion flower, lemon balm and L-theanine helps, and for energy – D-Ribose, a Ginseng complex, L-tyrosine and Dr. Bachs energy formula is good. The only problem with any of it for me is that it only works for a while and then I need to go off for a bit. The biggest help with energy and focus has been the D-Ribose along with the L-tyrosine and L-theanine which is great for calm focus, and the D-Ribose has been a life saver when I have physical work to do. Maybe you need to get out more, or perhaps you’d be better served by seeing a psychologist, or my favorite.. Let’s try THIS antidepressant. If I had one dollar for every time I was told these things and more, I’d be able to pack up and move to a warmer climate and afford a really good treatment program. Well thank you all for letting me go on and on. It’s been a long time since I have. In clinical trials, they used 5 grams of d-ribose x 3 times a day for 2 weeks, then they cut back to 5 grams x twice a day as a maintenance dose. Currently I’m on Tramadol, Ibuprophen, Levoceterizine, and Plaquenil ( the generic form). 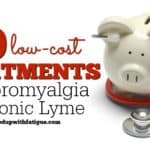 I think they are helping somewhat with the pain and inflammation, and the Levoceterizine helps with the possible Mast Cell problem I may have if I take it twice a day. The Dysautonomia is still yet unaddressed, but I am hoping to make some headway with that in January. Have been having quite a lot of sudden stomach upset and urinary incontinence that hits with no warning, and hot and cold spells that come on unexpectedly, as well as some episodes of feeling faint and weak. My doctor is an MD but he practices integrative medicine. 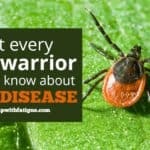 D-mannose is routinely used by people w/ Lyme to help urinary issues. I didn’t personally find it helpful for my urinary issues but many do. 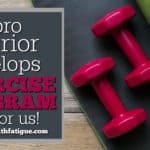 I started the Autoimmune Strong fitness program six weeks ago and it is the first and only fitness program I have tried that doesn’t cause me a pain flare! I also love coffee enemas and smoke pot to help me sleep. It took me a long time to accept this is a treatment option, but it works for me with very few side effects. That is such good news about Autoimmune Strong. I’ve been putting it off b/c of dealing w/ this back pain situation and just not wanting to maybe trigger bad symptoms. Your comment makes me feel better about it. Yes, coffee enemas and cannabis are both great! Definitely work better than some of the conventional treatments I’ve tried. Hi Kim, I’m so glad you’re getting some relief from Quell. I just love, love, love that product, and am so thankful it is available to us. Can u tell me how much the Quell device is? I got The Fibro Manual and the Topricin creme.. the creme is helping. Yesterday I rinsed off my car and wiped down the Windows and the body. I take Tramadol and Cymbalts. I take lots of vitamins etc since I had gastric bypass surgery. Recently I started taking Hylauronic acid/msm/0Glucosamine. My joints are now lubricated and I am starting to heal myself. Thanks to you and your suggestions. 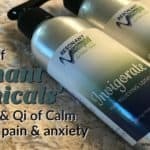 I’m glad the Fibro Cream is helping you! Is there one product that combines the acid/msm/gluco or are you taking those separately? I can see how all of those would help. Thank you for sharing! THIS WAS A GOOD MOTIVATIONAL BOOST TO KEEP TRYING THINGS. I have a very similar story and had to wean off abx last year. I use essential oils for both antibacterial (Lyme co-infections, intestinal strep (aka SIBO), and antiviral (for EBV, CMV). I take a turmeric blend called Nature’s Relief by Adeeva for pain (this has helped reduce my pain by at least 50% for 4-8 hours). I am working on my digestion/gastroparesis with a therapist. I too am considering medical cannabis as I have met many who are now fully functional using it. Thank you for sharing! I’m going to check out the Nature’s Relief. I’ve tried different curcumin/turmeric supplements but haven’t found one that works consistently. The best I’ve found is Curamed from Dr. Teitelbaum. Maybe combining turmeric w/ other ingredients like in Nature’s Relief would help. I’ve been prescribed a number of supplements by a naturopathic doctor, and though it’s difficult to know for sure what is helping, I feel like there has been a significant improvement since starting to take l-carnitine. Thank you for all the ideas! I’m a Fibro sufferer as well as an injury to my lumbar spine. And yes, my lower back hurts just as much, if not more. I want to let people know about Low Dose Naltrexone (LDN) that I started 2 weeks ago. I started at .5mg, which is advised for Fibro, and have worked up to 1mg, continually increasing until I reach the dose for me. Its been described as “rebooting your nervous system” and I definitely have felt changes in my body. I had 3 rough nights when I started on 1mg, and switched to taking in the mornings. And doctors have said you can Tramadol, as I have, you just have to watch how soon or after the LDN you take it. I am currently cut back to 50mg Tramadol4x day, from the previous 6 a day before the LDN. 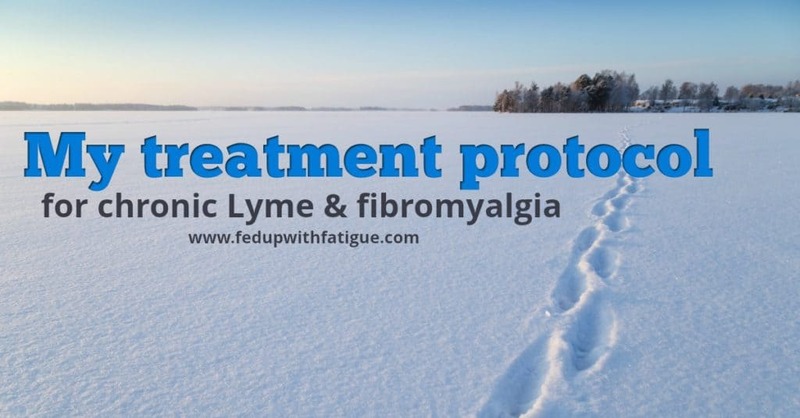 I went to see my Dr today, and as a result of my researching and telling her about it, she has another Fibro client she has started on LDN and is having the same similar experience. And I’ve lost 9 lbs in 2weeks😁 The LDN has cut my appetite way back. I no longer have to take 100mg Tramadol, 1300mg Tylenol upon waking and lie there an hour before I even try to get up. I am planning on LDN literally turning all my my medical issues around. After 9 years of Fibro, 2 years of back injury, I had to give it a try and am happy, so far. I would also like to add the RSO at bedtime, which I will work on next. Thanks for all the research and news, as I’ve learned a great deal! I’m so glad you’re getting good results w/ LDN. I’m a big fan of LDN. So many people are helped by it. Thanks for posting as it’s always helpful to see what other options there are that have been helpful to some people. I wish I could say something has helped reduce my pain down from the daily 6-8 but my Tramdol/ Tylenol combo stopped working a long time ago except for occasionly taking the edge off. I see the PCP who is managing my FM for a yearly appt. next week. We will do the same dance where he says ” so it’s helping” and I say not much and he says find another specialist though we both know there’s not much left to try. I haven’t tried the infrared sauna though and will look around as the cold and damp weather coming in here to Cape Cod has worsened things even more for me. I stated Qi Gong a few weeks ago and am finding it painful and exhausting but, like everything, it seems to help 30% of us LOL so I will tough it out for a while. One thing I haven’t tried is flotation therapy, not close to me, but that has some positive results. Hi Michelle, so nice to hear from a fellow Lymie! How are you doing on Vital Plan? Do you think it’s helping you? Anything else you’ve tried that seems to be working? Aside from the chronic pain, I think the bladder dysfunction is the toughest symptom I live with. It’s just miserable when you walk around feeling like you have to urinate all the time. I know IC is horrible as well. My urologist is considering diagnosing me w/ that since I haven’t responded to the usual medications for urinary urgency. The hyophen seems to help a little but there are still days like today where nothing is helping. i was able to get rid of IC after a couple of awful years. i did acupuncture, followed the IC diet which is very limited, took prelief and aloe vera, started juicing, took quercetin. Congrats! From what I’ve read about it, it sounds like it’s tough to control.